Our Line of Credit helps you finance receivables and inventory, increase working capital, fund investments and meet short-term cash needs. If you need a short-term business financing option, you may need a business line of credit. Business credit lines can be used multiple times, as opposed to one-time loans, and typically have smaller interest rates and closing costs than business loans. Rather than having the monthly payment of a business loan, you make payments on your business line of credit until you pay off your balance. Business credit lines are best suited for anticipating common problems with managing cash flow. Project Finance is one of the key focus areas for Bank One. We have institutionalized capabilities to successfully manage the unique and multidimensional process of project finance transactions led by customized project structuring approach. A world of international payment options at your fingertips. An error has occurred. Try Again. This Website is owned and operated by BANK ONE LIMITED and the use thereof indicate that you accept the Bank’s Terms and Conditions of Use. If you do not agree to the Terms and Conditions of Use, you should not use the Website. The Bank may, at its entire discretion, at any time and without notice, modify or update such Terms and Conditions of Use. Such changes shall be effective immediately and you shall be deemed to have accepted same if you continue to use the Website. 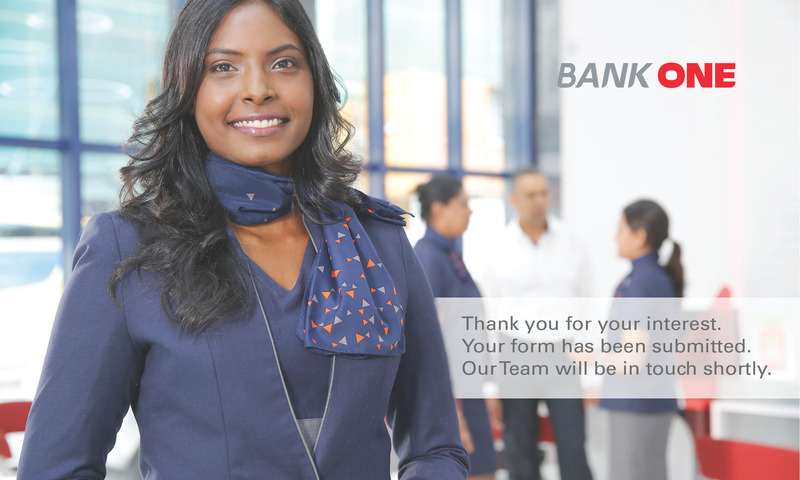 Although the Bank endeavours to provide correct information on its Website, it does not give any warranty express or implied as to its accuracy, completeness and reliability. The Bank does not accept any liability for any errors or omissions of whatsoever nature as regards information, materials, functions and applications contained in its Website or as to any third-party Websites linked to or from its Website. 1) Information available on the Website are allowed to be printed and / or downloaded for personal use only and not for commercial purposes. You may not reproduce, transmit or store any information contained on the Bank’s Website on any other Website without the Bank’s written permission. 2) The Website is intended to provide general information on the Bank and its products and services. No information contained on the Website shall constitute or is intended to constitute financial, legal, accounting, investment or other professional advice or services. You are advised to take professional advice from a suitably qualified professional or adviser before taking any decision relating to your finances or business. 3) You acknowledge that information transmitted via the Internet is susceptible to monitoring and interception and you will be bear all risk of using such means. You further acknowledge that any unsolicited information communicated to us via Internet cannot be guaranteed to remain confidential. 4) The Website may contain technical, typographical or other inaccuracies and you are urged to contact us to confirm all information contained on this Website before placing any reliance on it. 5) The Bank agrees to make reasonable efforts to ensure full performance of its Internet Banking transactions. The Bank will be responsible for acting only on those instructions sent through Internet Banking which are actually received. The Bank does not assume responsibility for any malfunctioning in communication facilities not under its control that may affect the accuracy or timeliness of messages you send. The Bank will not be responsible for any losses or delays in transmission of instructions arising or caused by any browser software. It will, furthermore, not be accountable should you provide incorrect instructions or if your payment instructions are not given sufficiently in advance to allow for timely payment or delays in mail service. The Bank will not collect any information about you except where it is knowingly provided to us through this Website. The information we collect about you will depend on how you use the facilities offered via this web site. In the event that you enter information in the process of completion of an online application form, the information will only be collected by us if you submit that online application to us. In other words, if you log out prior to submitting your application, any information which you had entered would be automatically deleted. Use the information to improve its products and services. Sending periodicals and promotional emails on new products, special offers or other information which the Bank thinks you may find interesting using the email address which you have provided. Our Contact Centre may call you to suggest products and services that are relevant to your needs based on the information you have provided. Occasionally, the Bank may also use your personal information to contact you for market research purposes. The Bank may contact you by email, phone, fax or mail and may use the information provided to customise the Website according to your interests. The Bank will not sell or distribute your personal information to third parties unless it has your permission or is required by law to do so. You may request details of personal information which the Bank holds about you under the Data Protection Act 2004. If you would like a copy of the information held on you, please write to us. If you believe that any information the Bank is holding on you is incorrect or incomplete, please write to or email us as soon as possible. The Bank will promptly correct any information found to be incorrect. In no event will the Bank be liable for any damages including but not limited to direct or indirect, special, incidental, consequential or punitive damages, losses or expenses arising out of the use of its Website, or incurred as a result of any failure of performance, transmission of information, any interruption or availability of its Website, delay in operation or transmission, computer virus, loss of data, or otherwise. Neither the Bank nor its directors, shareholders, agents, consultants, representatives, officers or employees shall be liable for any damages or losses resulting from your use or inability to use its Website or any information contained therein, including without limitation any direct or indirect, special, incidental, consequential or punitive damages whether arising out of contract, statute and tort or otherwise.